Clippers: The Clippers were 2 of 10 from deep in the first half, when they had only 13 assists. 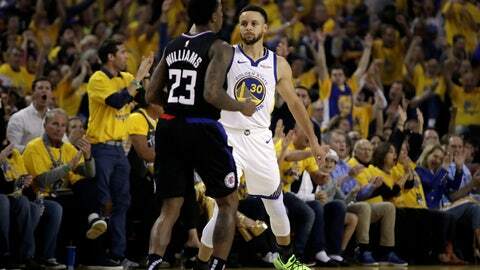 … Los Angeles, which has lost four straight on the Warriors’ home floor, was outrebounded 53-40. Warriors: Curry notched his fifth career double-digit postseason rebounding game. … Durant (3,679) passed Dirk Nowitzki (3,663) for 15th place on the career playoff scoring list. … The Warriors have won seven straight postseason Game 1s and 14 of 15 openers in all — going 16-1 in their first game of a series dating to the 2014-15 season.